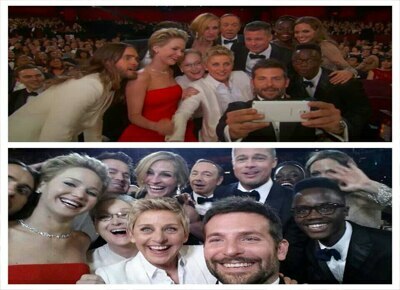 Ellen de Generes made history after snapping a celebrity selfie at The Oscars. Ellen de Generes who’s hosting the 86th Academy Awards has made history on Twitter today. During the live show, Ellen took a selfie with Hollywood’s biggest movie stars which includes Jared Leto, Channing Tatum, Jennifer Lawrence, Meryl Streep, Julia Roberts, Kevin Spacey, Bradley Cooper, Brad Pitt, Lupita Nyong'o, Nyong'o's brother, Peter and Angelina Jolie. “If only Bradley’s arm was longer,” she tweeted after Bradley took the photo. “Best photo ever #oscars,” she added. Ellen broke U.S. President Barack Obama’s previous record of the most retweeted post of all time. Barack Obama’s election-night photo with US first Lady Michelle has been retweeted 778,000 times. Ellen broke that record in less than an hour. Local personalities have expressed their “amusement” over Ellen’s photo. “EPIC!!! ?????? After Obama's #selfie, this could be the next most talked about w all the stars running to be in it!!!!! #oscarselfie - loooooove it!!!! #mar32014,” Karen Davila posted. “This photo will break Obama's record as most retweeted photo! Selfie w the most beautiful glam people in the world,” Ces Drilon tweeted.